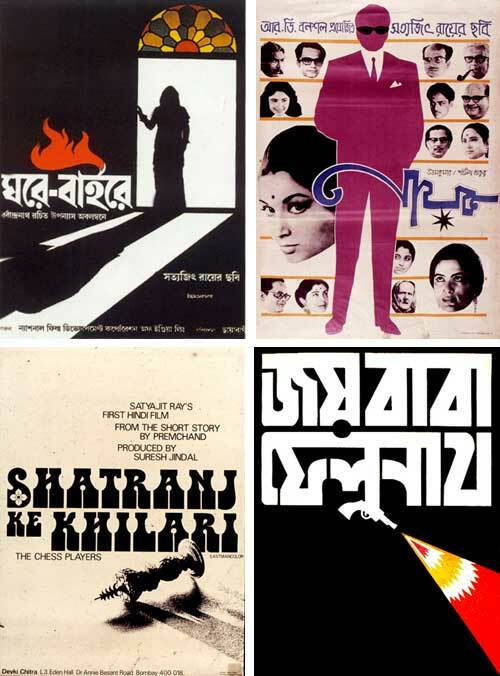 On top of his many accomplishments, Satyajit Ray was also a graphic designer who designed many of his own film posters. Satyajit Ray—a titan of world cinema but also, these days, somewhat of a forgotten man (a situation not helped by the dearth of Ray titles on DVD)—is the subject of a two-week retrospective at the Walter Reade Theater that started on Wednesday and may go a long way to restoring his place in the hearts and minds of New York cinephiles. 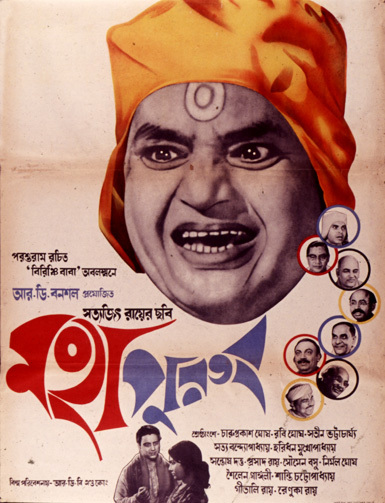 The Bengali director was a man of many talents: as well as directing more than 30 films between 1955 and 1991 he also composed the scores for most of his films, wrote all his screenplays, was an accomplished photographer, illustrator and costume designer, and, most importantly for Movie Poster of the Week, was also a graphic designer who designed most of his own film posters. I can't think of another example of this phenomenon. Though Abbas Kiarostami—an heir to Ray in many ways—is also a trained graphic designer, I have never heard of him designing the posters for his own films. The above poster, for his 1965 film The Holy Man (showing in the series) is typical of the Ray style, with a lot of cut out heads, bold color and superb use of hand-lettered typography. Ray studied economics before going to art school under the mentorship of the great Bengali poet Rabindranath Tagore (a close friend of his father and grandfather, both of whom were popular writers and illustrators). After art school he joined a British advertising agency where he became a book-jacket designer and typographer and rose to be art director within a few years. On a commission from the company he traveled to London in 1950 and, already a keen cinephile, saw The Bicycle Thief and Rules of the Game, two films that had a huge influence on his own humanist style of filmmaking. 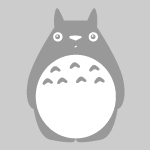 There is a lot more information on Ray's graphics, font design and illustration over at satyajitrayworld.com. Below are more of Ray’s posters for (from top right going clockwise) The Hero (1966), The Elephant God (1978), The Chess Players (1977) and The Home and the World (1984). Thanks to Ruchika and Faarzein for their help in identifying the poster. I have been a Ray follower for a while now and have seen most of his major works, read his short stories, books, Feluda adventures and I think its high time Criterion and Ray’s work can benefit mutually.Come to think of it, these poster designs can be easily be scaled to criterion Ray releases, excellent!! A majority of the DVD’s are available on Netflix and Amazon but the quality is definitely below par and the subtitles need a trimming too…My hunch says the days of glory to revel in Ray’s work are soon…. just from a graphic design POV… all these posters are excellent, raw, brilliantly evocative. Raw’s a great word for it T.